Here’s a close up. I love the combination of yellow-green and purple-black. Plus they are so glossy! 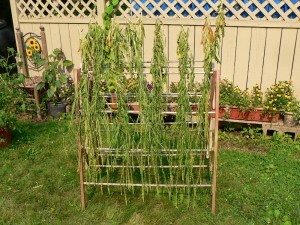 A couple days later, on July 5, I decided it was time to harvest the weld. I had weld growing in two places this year. 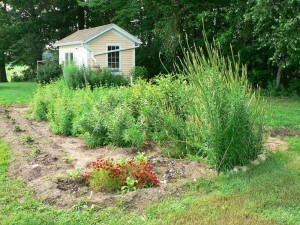 One large bed at Amethyst Brook, our community garden plot, and one small bed at Bramble Hill Farm. Here’s a view of the bed at the community garden. I’m letting the milkweed grow in case a monarch butterfly should happen to come along. I know the weld is hard to see against the backdrop of giant mint and other plants in the background. The plants at the community garden had a very vertical growth habit, without a lot of branching. 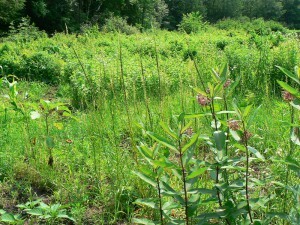 The flowering stalks with maturing seeds are the most prominent feature in this photo. 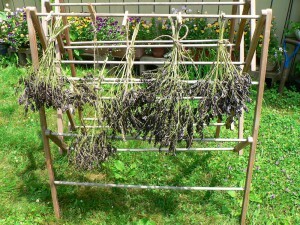 Here is that crop hung up to dry. At this point I thought, “Well, while I’m at it, I may as well harvest the rest of the weld.” This actually did turn out to be a good idea, because at the time the plants were free of moisture. Since then we’ve been in a rainy weather pattern. Here’s the dye plant and fiber plant garden at Bramble Hill Farm on July 5, 2015. 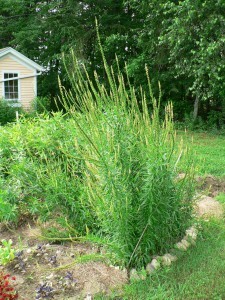 The weld is the tall plant in the foreground. Here’s a closer view of the weld bed. The plants here were more branchy and inclined to flop over, so I propped them up with bamboo stakes. The tallest ones were well over my head. 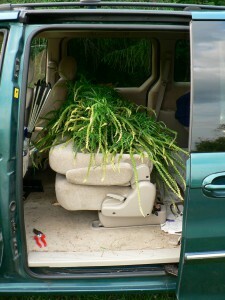 Here’s the weld crop filling up the middle of the van! Once I got this home, I had a very large quantity of weld indeed. Now, I have probably mentioned this before, but weld has a very strong odor. Matthew describes it as a combination of pee after you’ve eaten asparagus combined with compost. Rainy weather was on the way, so the weld had to come into the apartment, but we didn’t want the whole place to be infused with eau d’weld. Matthew very kindly rigged up an arrangement in the downstairs half bath using the dehumidifier. 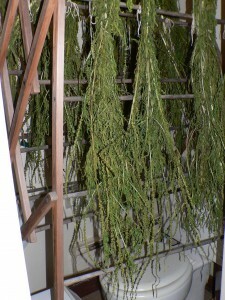 We could shut the door, contain the odor, and create a dry environment. 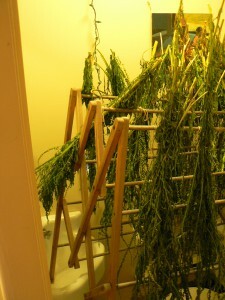 Here’s the set-up on July 7th after it has already dried quite a bit. And here it is this morning (using the flash this time). Thanks to the humidity in the air, it’s not as crispy as I’d like, so I’m waiting a little longer to bag it up for storage. 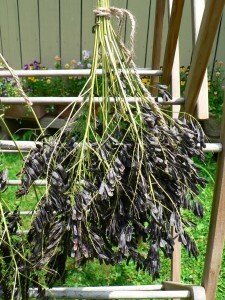 I cut off the most mature seed-bearing stalks and am drying those separately in contained paper bags. I now have a zillion weld seeds.